Flying in for that all important meeting. Why not stay a day or two and brush up on your Excel or web design skills. At the Heathrow computer training centre we can help with your Microsoft Access database or other problem before you fly back. You'll then be fully prepared to meet whatever your boss or clients throw at you; IT wise that is. 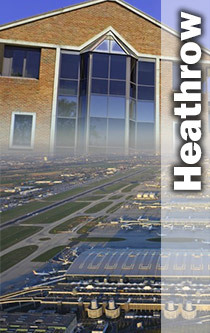 The London Heathrow Airport business centre is set in a three-storey modern building five minutes from Heathrow's Terminal 5. Set in secluded grounds, the building has an impressive high-ceilinged reception and there are views of the planes taking off and landing from some offices. The building is home to a variety of office-based businesses including those working in IT, transport and freight, while the surrounding area is popular with airport-related businesses. Close by car from Terminal 5, there is also easy access to the London Underground, Heathrow Express and the M25 and M4 motorways. It is a short drive to cafes, restaurants, bars and shopping in West Drayton.